Teleconference Tuesday May 12, 10-12 Eastern Time. Charlie Perkins and Bob Moskowitz: Draft document on tunnelling issues, architectures, etc. Send to IAB list. Keith Moore and Charlie Perkins : Draft document on “finding stuff” issues, architectures, etc. Send to IAB list. Jon Postel (IANA): Build consensus on how to assign IPv6 addresses–get the registries to do something or perhaps form a BOF on the issue.–Postel and Hinden had a meeting with representatives of the registries to discuss draft proposal. It will be published as an Internet Draft; the registries will take it to their members for comment. Finally, will probably be published as an informational RFC documenting the agreement among the registries. Radia Perlman: What should be in protocols.–suffering from lack of interest on mailing list. Radia will post to IETF list with a pointer to discussion list. Steve Bellovin: Security workshop report.–with RFC editor, waiting for IPSEC documents to clear. Welcome to Ned Freed and Tim Howes. Fond farewells to Radia Perlman and Robert Elz. After the workshop, there was one rather vociferous complaint regarding the closed nature of the invitation-only workshop. However, limited attendance by a set of experts is both the only way to hold a valuable workshop, and is entirely within the IAB charter, RFC 1601. Remember, neither the IAB nor IAB workshops set standards. Radia and Steve previewed their overview of the workshop for Friday’s IAB open plenary. See the notes and presentation slides from the plenary. Thanks to Steve Deering and Radia Perlman for setting up the workshop, to Cyndi Jung for taking care of local arrangements, and to Charlie Perkins and Sue Hares for taking detailed minutes! These items will be clarified and prioritized by email discussion going forward. Things were going fairly smoothly until December, when the US Federal Government got involved. Green paper comment period just closed. Unclear what will happen next. POC has been doing very little technical work. Question from the IAB: Should the IETF take on specifying a protocol for interactions between registrars and registries? Yes, this would be a useful thing to do now. All existing proposals on the table require this functionality. Protocols for maintaining consistent copies of a registry would also be interesting. Question from appointees: Does the IAB want to relinquish the voting rights of its appointees to the POC when the POC changes its constitution? The POC appointees pointed out that everything is done by consensus anyway, and this would be a politically good thing to do. The IAB’s proper role is to make sure that reasonable technical solutions are pursued–voting rights appear irrelevant to executing this role. Issue is when should this be done, and should this be unilateral or conditional on everyone else giving up their vote? The IAB in general felt that the voting rights of its appointees is not that important–we want to advise, not vote. However, we do not want this to be taken as a repudiation of the POC. A decision on this will be taken when the revised constitution of the POC is decided. Tony reported on the NAT working group meeting today. The working group is focused on making NATs as good as possible. The IAB needs to focus on the areas where NATs impact the architecture of the Internet. We need to document the long-term consequences of NATs, so that people don’t erroneously conclude that NATs preclude the need for IPv6. More broadly, as with firewalls, perhaps we should also explore ways that applications and NATs can work together better. Brian Carpenter agreed to continue to serve as chair; his offer was met with enthusiasm. dimensions #sources, #receivers, #groups, amount of data, burstiness, duration, topological distribution, . from multi-homed host, which outgoing interface to use? => hold a BOF -> WG? 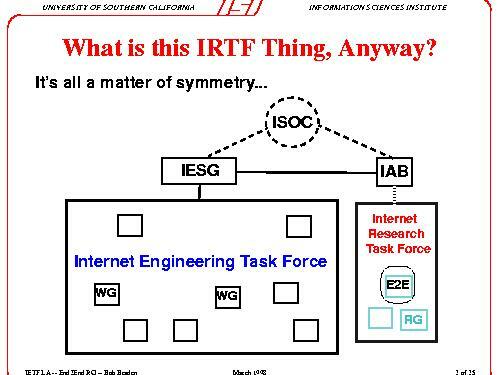 What is this IRTF Thing, Anyway? 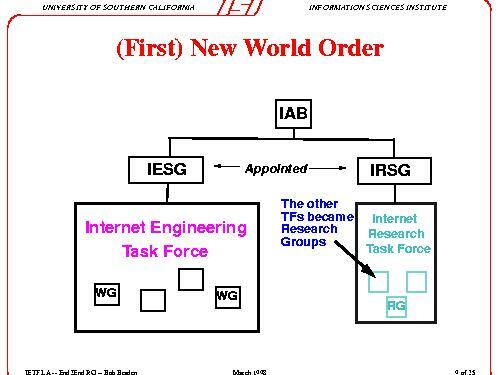 The INternet had outgrown the DARPA research program that created it. Fostering development of new E2E protocols for network researchers and users. Advisor to IAB & RFC Editor on E2E issues. The E2E RG is just a bunch os Internet protocol bigots who like to meet twice a year to share crazy ideas and to debate esoteric architectural questions to the point of exhaustion. My answer: “NOT routing or network management”. Or (almost) any other Internet-relevant researchy issue that tickles out fancy. But what is this ‘research’ stuff? A fair question… these are muddy waters. A. “Research is what you do when you don’t know what you are doing. Research is when you are searching for universal concepts or mechanisms, or simply searching for uniderstanding. The product of research is the written or spoken word. None crossed threshold be become a standard. Monitored research looking for a universal RM protocol. No successful, but lead to SRM. What if the port numbers were in the IP header? What if clock synchronization were a fundamental Internet mechanism? What if UDP streams from non-adaptive apps become significant? transport performance problems were in implementations, not in the protocols. (Random Early Detection) [Floyd & Jacobson]. The Quixotic (?) search for a ‘phase change’. Early research goal: supplying multiple grades of Internet service, not just Best-Effort. Many discussions of packet scheduling and admission control algorithms. If we could not support multimedia services over IP, Internet growth could stumble and ultimately stop. In 1989, the ascendancy of the Internet architecture was by no means assurred. E.g., the OSI war may have been won, but not surrendered. The research agenda has shifted to Differentiated Services. There are strong political & social forces battering against the technical consensus upon which the Internet rests.